Wonkwang University Hospital (WUH) and the Eighth U.S. Army (EUSA) in Gunsan, North Jeolla Province, have recently reaffirmed the memorandum of understanding signed between the two sides last year. 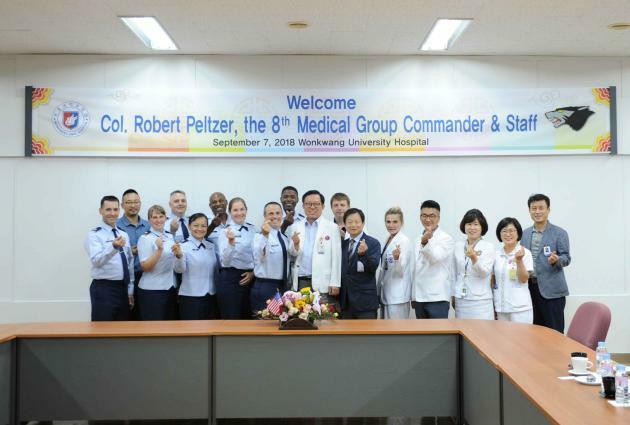 WUH President & CEO Choi Doo-young (sixth from left) and Colonel Robert D. Peltzer (at Choi’s right facing camera) make gestures of friendship, along with other medical professionals and Eighth U.S. Army officers, at Wonkwang University Hospital in Iksan, North Jeolla Province, Friday. Colonel Robert D. Peltzer, the medical group commander, and other army officials visited the hospital for this purpose last Friday. Under the MoU, soldiers, civil servants and their families working at the Eight U.S. Army’s Air Force Base in the southwestern city will receive the medical services in all areas, including medical examination, diagnosis and treatment at the hospital. The agreement also calls for maintaining a close cooperative system of emergency medical services and providing medical support in case of natural disasters, mass casualties, terrorist incidents and war situations.